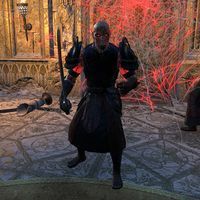 Spiderkith Venifexes are hostile Spiderkith Ravagers associated with Mephala that use Daedric swords in combat. They can be encountered in Crypt of Hearts II and the Spiral Shadows round of the Maelstrom Arena. Ritemaster Iachesis: "Mephala's Daedra! They sealed the chamber. We'll need to go through them." Spiderkith Venifex: "Mephala has sealed this place, mortal flea!" Ritemaster Iachesis: "The barrier of webs. Burn it away so we can enter the rotunda." 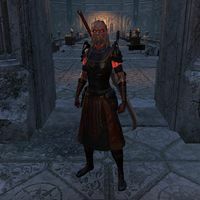 The ones in Crypt of Hearts and the Maelstrom Arena use Daedric style armor and the old skin, while the ones encountered in Summerset use the Silken Ring style and the new skin. Spiderkith in the College of Sapiarchs may say "Mephala has sealed this place, mortal flea!" despite the dialogue not being related to the quest. This page was last modified on 6 January 2019, at 02:25.